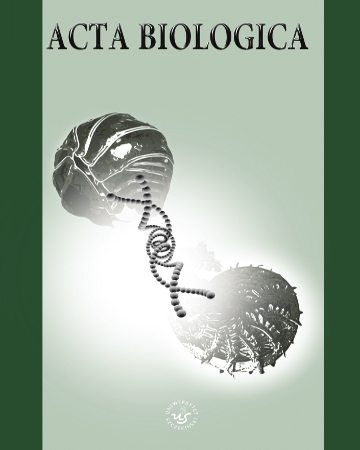 «Acta Biologica» is an international journal publishing original or review papers of all biological areas. It publishes papers on all topics of biology. We welcome submissions of original articles, review articles, short communications, and commentaries on any level of biological organization. «Acta Biologica» especially welcomes manuscripts linking some aspects of the taxonomy, biogeography, ecology, behavior, physiology and molecular biology. We also encourages submission of research related to conservation biology and wildlife management. It is published by the Faculty of Biology, University of Szczecin. «Acta Biologica» established in 2001, was formerly published in the Polish language (until 2009) now in English. The journal was published as a hard copies copy till 2009, for since 2010 it has been is published online. Acta Biologica is an open access journal which means that all content is freely available without charge to the user or their institution. Users are allowed to read, download, copy, distribute, print, search, or link to the full texts of the articles in this journal without asking prior permission from the publisher or the author. This is in accordance with the DOAJ definition of open access DOAJ. There are no submitting nor processing charges for publication. Nine points according to List B of Academic Journals of the Ministry of Science and Higher Education dated December 9th, 2016.